This quiet hard-luck Californian started out in karts in 1972 and had become US Western Division Champion before moving on to Formula Fords in 1975. 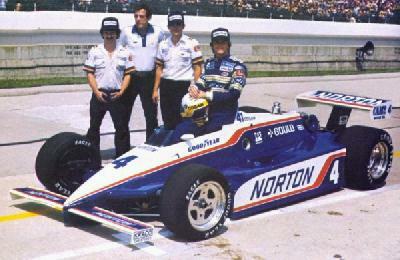 The following season he netted two wins in the same category before stepping up to F Atlantic, Kevin earning eighth place in the 1977 championship. He continued in the formula for 1978 and 1979, his final season seeing him take three wins. 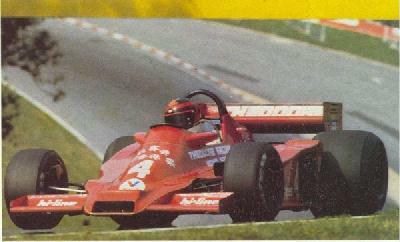 His first taste of Formula 1 came in 1980 when he drove a Theodore Racing Wolf WR3 in the Aurora F1 series (here he is seen at Brands). He finished 10th in the championship. Later in the season, with the support of Teddy Yip, he took the step to proper GP racing when he rented a RAM Williams FW07 for the Canadian GP. He didn't qualify. Cogan's second DNQ concluded his brief GP career which should have endured much longer. He had the proper credentials for Formula 1 - he was certainly not in the Londono mould - and should have had a chance to equal at least Eddie Cheever's career in GP racing. Being a single-seater man he now headed towards the Indycars. A few months later he was ready for his first Indianapolis 500. Cogan drove a 1980 Phoenix-DFX and showed really well in his first outing: Kevin recovered from a early pitstop that dropped him to dead-last to finish a fine fourth. One week later he finished second on the Milwaukee mile and caught the attention of Roger Penske. In the driving seat of the all-conquering Penske-DFX PC10 everything looked bright for the young racer. But it all went terribly wrong. He qualified second in his back-up car at Indy 500 only to see his race ruined by a controversial pace-lap accident that was blamed on him. This unfortunately set the tune for Cogan's year which was marred by several more crashes, resulting in his sacking from Indy's legendary team after only one season. A number of barren years for midfield Indy outfits followed. Then things began to look up when he joined Pat Patrick's team for 1986. In Patrick's March-DFX 86C he took his first CART win at the Phoenix oval in April. One month later he qualified a fine 6th for the Indy 500 and suddenly everyone saw the talent that had gone to waste at Penske. In the race Kevin was a front-runner all day: he led laps 76-77 and was in a strong third on lap 187 when he passed Rahal and Mears to take the lead. Kevin extended his lead lap by lap. By lap 191 his lead was over three seconds as he headed for victory. Then Arie Luyendijk crashed with 5 laps to go. Poor Kevin saw his work come to nothing: he had lost all of his advantage. But would he be lucky enough to see the race finish under yellow flags? Sadly for Cogan the green-flag was waved on lap 198. Rahal got the jump on Cogan and charged into the lead. Kevin was unable to overhaul Bobby during the two laps remaining and finished second to Bobby Rahal, trailing by a mere 1.441 seconds. His next Indy headline was of a somewhat different note, as on the second lap of the 1989 Indy 500 he crashed out his March 88C in spectacular fashion. For those who have witnessed the accident and were present at the California Speedway recently, the similarity with Greg Moore's fatal crash at the Fontana track won't have been lost on them. Many were certain they had just seen a tragedy happen before their eyes. Just like Moore, Cogan lost the car at 330kph coming out of Turn 4, possibly getting caught by turbulence. He got into a half-spin and veered to the left, hitting the inside wall amidst a shower of debris. 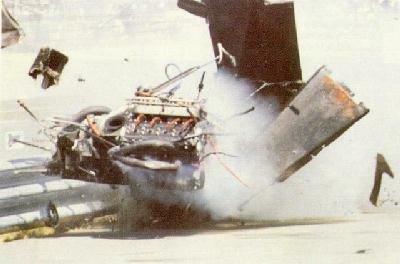 The out-of-control car remains continued until they hit the edge of the pit wall, again shattering what was left into more bits and pieces, before the tub came to a stop. The onlookers were amazed to see Cogan move in the tub lying on its side. The next thing they saw was Kevin unbuckling himself and crawling away from the wreck. He was practically uninjured. The ever so unfortunate Kevin Cogan had been extremely lucky. In the 1991 event, though, Kevin again crashed out. This time he smashed his legs. Kevin had to endure a lenghty re-hab period in which he missed out on the 1992 race. The following year Kevin was back for his final attempt to win the big one. He started from 14th position and performed consistently to finish in the same position he started in. 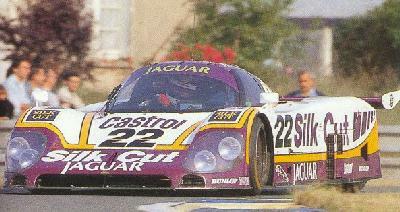 The versatile Cogan was also hired by Silk Cut Jaguar in 1988 to drive at Le Mans. He did a fine job backing up the winning Jaguar by finishing fourth together with fellow Indycar driver Derek Daly and Aussie touring car driver Larry Perkins, who was dubbed "The Cowangie Kid" in his youth. Kevin did over a hundred CART races and was equally at home on both oval and road circuits. Cogan's second, and final qualifying attempt in Grand Prix racing, before moving back to the American single-seater formulae. 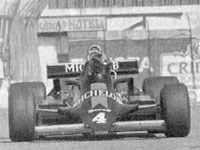 Also worthy of comment is the Tyrrell's unusual black livery, thanks to a one-off sponsorship deal with Michelob Breweries. Team mate Cheever's car retained the traditional Tyrrell blue colour, but was also adorned with Michelob decals. Cogan made his mark in a Formula Atlantic Ralt in 1978, and 1980 saw him attempt the British Aurora AFX F1 series in Theodore/Hi Line Racing's Wolf WR3 and WR4. Cogan had a mixed season, ending up 10th in the championship. Most memorable of his efforts was a potentially winning drive at Monza ending up in a huge accident. He was gaining on de Villota's leading Williams when the WR3 suffered a broken right front upright on the approach to the Ascari chicane: "I just touched the brakes and - bingo - the right front suspension broke and pitched us into the wall. There was a corner station right there - you know, a bunch of guys with flags - and they confirmed that the wheel pointed outwards all of a sudden before the car hit the bank. The accident seemed like forever, 200 yards I guess. My foot came off the brake pedal with the impact and landed on the throttle again, so the engine was screaming and dirt came into my helmet by the shovelful when the visor snapped. You can certainly say we had a big one." 1980 also saw his first attempted GP qualification in Canada, driving Theodore's Williams FW07B with Rainbow Jeans sponsorship. As non-qualifier he had the distinguished company of Jody Scheckter; at least Cogan had the excuse of not being used to ground effects after a ground-effectless Aurora season. His final GP effort is the topic of the photograph, as described in the opening paragraph. Once again he was out of luck. An interesting, if short-lived point in Cogan's subsequent Indycar career concerned his Ligier (!) outing at Long Beach in 1984. Guy Ligier and promotor Mike Curb had grand ideas of breaking into CART racing using a hastily reworked Ligier JS21 chassis, along the lines of F1 refugee team Theodore's efforts. This was a total failure, however, and Cogan abandoned the Ligier-Curb for an Eagle 84SB, still backed by Curb. Success was not much more forthcoming, although Cogan did attract attention with a number of monocoque-mangling accidents.